Jimmy Wales must be chortling into his cheerios when he sees how his baby called Wikipedia has influenced so many areas of life, both online and offline. Despite the fact that Wikipedia seems to be on a never-ending begging quest for donations, it is still the number one dominant site when it comes to reference articles 7 Amazing, Yet Overlooked, Wikimedia Projects You Should Check Out 7 Amazing, Yet Overlooked, Wikimedia Projects You Should Check Out Read More , winning pub quizzes, cheating at homework assignments and assassinating 244 year old print encyclopedias. Now it seems to be on a murderous rampage through libraries, books in general and smaller reference webpages. When will the Wikipedia juggernaut end? And how many casualties will it have ended up claiming? Watch that blood on the floor. 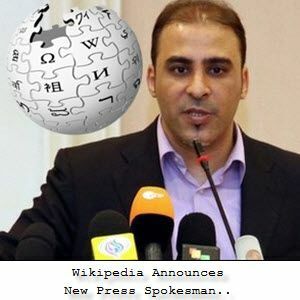 I have never hidden my disdain for Wikipedia in the past – in my opinion, it has a high potential for containing errors which are then accepted as solid facts by people reading the articles. It doesn’t have the same level of professional fact checking as the Encyclopedia Britannica, which is why I find the news of the EB’s print edition going out of business very disheartening. People make a very bad habit of quoting from Wikipedia in dissertations and assignments, only to find out when it’s too late to change it that the quote is wrong because a pimply teenager in his bedroom decided it would be funny to change it to something else. Wikipedia should be the start of your research, not the end of it. Let us know what you think of the infographic below and of Wikipedia in general. Can it be relied upon to deliver highly accurate facts or can it be trusted as far as Jimmy Wales can be thrown by a baby midget? Do you use Wikipedia to cheat at homework and assignments? Spill your guts in the comments. Explore more about: Infographic, Wikipedia. Really liked your comment about Wikipedia being the beginning of research. Well done! Found your comment about 'baby midgets' crass and offensive. Really? Allow me to amend my previous statement. There have been a lot of studies involving the accuracy of Wikipedia, but most of them worked with relatively small samples. So, it's hard to say anything conclusive concerning the comparative accuracy of Wikipedia / Encyclopedia Britannica. The most we can say is that Wikipedia's accuracy should not be discounted, because it isn't far removed from the accuracy of other big Encyclopedia. Another thing that should not be discounted is the value of checking your sources, no matter what encyclopedia you use. If you want to write a quality paper, there's NO source you can quote blindly. Wow! Enlightening infographic. It's a little sad, but then, that's progress, huh? Somebody necessarily assist to make severely posts I'd state. This is the first time I frequented your web page and to this point? I amazed with the research you made to create this actual publish extraordinary. Excellent process! Sorry, but you cannot compare a wikipedia-article (with maybe 1000 lines of non-proovable information) to a stack of books with maybe 100.000 lines of information. Sorry, but this is how stupid people think. Wikipedia can be compared to an encyclopedia, not to a libraria. You are mixing two totally different things up. I don’t know about the numbers, but it’s not true that Wikipedia forced Britannica to end the print set. Wikipedia had nothing to do with it. It was the Internet, the PC, and the new habits of mind they brought into being that did that. The major sales decline in the print set happened in the 1990s (before Wikipedia); it’s been a marginal product since then. And not to worry: Britannica’s various digital editions have the same level of professional fact checking you liked about the print set. and most of my readings were accessed online in all classes. One useful thing that no one has mentioned as far as Wikipedia goes is their citations ! How about using them as a branching-off point ? I did that in the dead-tree era and still do when digging a bit deeper on a subject. It is the whole educational paradigm which is in a process of change, for good or for ill. What NEEDS to be taught are the critical thinking skills which empower a student to evaluate sources from every location. Wikipedia killed EB print edition - Wrong. They killed themselves. Actually Windows and Internet in general killed them. Wikipedia is just nails in the coffin. Wikipedia is not a good source of information - Wrong. It is an excellent source of information. Much more information, nearly as accurate, and much more accessible than EB. But, as has been pointed out, it is a start, not the end. But that has ALWAYS been true of any encyclopedia. Wikipedia is responsible for the decline in books and libraries - Seriously? So when's the last time you read LOTR by first going to wikipedia? What about amazon.com, Internet in general, Kindle, Nook, etc.??? You really think that wikipedia is causing or is even the most culpable cause of the decline of libraries? I'm not buying it. I recall that by Senior High School any citation of any encyclopedia would have my history papers marked heavily down and for good reason. As much room as they took up on my parent's bookshelves, including an 1899 edition of EB. Certainly I'd never have gotten away with it at university level. Encyclopedia's, including Wikipedia, are starting points for research not definitive. They can get a student going on a paper but as for forming the main research tool they're not at all suitable for that. EB is the author of it's own misfortune, though. To be short EB misunderstood the Web, charged too much for access to it's site and either didn't know or appreciate that the Web links other sources together with EB's site or make it necessary that articles be updated in something approaching real time rather than wait for the "next" edition", something Wikipedia did and does get right. To be honest I haven't looked at the web edition of EB or the print edition in years because way back "in the day" it didn't figure it out and last time I looked at their web site it still hadn't. I've also noticed myself going less and less to dead tree sources as time goes on as there's almost always better and more up to date information available on the Internet than there is in any print edition in reference and non-fiction work as both are dated as soon as the ink is put to paper. The passing of the EB print edition, the declining use of dead tree libraries, the decline in the number of books published marks the passing of the baton from institutions and some industrial activity in publishing from libraries to the Web which is, in it's own way, the largest library in existence. What hasn't changed is that the reader still has the responsibility to determine for themselves what is and isn't accurate, which is the point of an education anyway. If a student plagiarizes Wikipedia or any other source they should get a big fat red F on the paper the first time and, at the college and university level, expulsion from the course the second time out for the semester. If a student stops research at Wikipedia, or EB's site for that matter, that will show in their work and probably quickly. In that case the student is taking up room better filled by someone else. It's sad that EB is ending the print edition. Not that I've looked at one in close to 20 years or sought one out. Perhaps it's my lifelong interest (passion for) history that's taught me to fact check everything and never stop looking deeper into something. Every document contains errors of one sort or another, even the most heavily edited for accuracy book in existence. The Bible. Fears, as James Todd expresses "society as we know it will re-educated in ways we can’t even begin to imagine" sound familiar to some similar ones made as the movable type press spread in Europe. So were fears about scholarship, how can you count on something when "anyone" could publish a flyer, pamphlet or book? Yes, more women, far more, need to be involved in actively editing and maintaining Wikipedia. Scholarship in many areas has to improve. We also need to keep in mind that the Web, not just Wikipedia has changed society beyond what we could have imagined 25 years ago. So has the technology to access both and the ease of accessing it. That will continue to happen for as long as the Web remains a disturbing force in information access and the economy. I'm not afraid of it. I'm actually looking forward to it! I have to question the stats regarding "visits" to libraries. Is that only including encounters where a person physically enters a building that houses the library? I do more than half of my work with students and faculty over email and over the phone. We have much much more material available online than in print. Students could theoretically be using the library's resources -- either articles, book, databases, or reference help from librarians -- without ever setting foot in the library. Not just that, which had me wondering about the numbers cited in the decline of library visits. In the small town I live in there's access to the Internet, card index and a host of other things. Bring your laptop or smartphone in and you're off. That's not stopping people from reading or referring to actual dead tree books but it adds a dimension which otherwise wouldn't be there in a town of 7,000 which is reach beyond the physical size of the library itself. The main public library in downtown Vancouver is heavily used, just try to find a place to sit!, which also allowed Web access from the earliest days of the Web, card files, locations and a host of other information. It's also become a social destination since it was built. It's too bad that other libraries can't accomplish that last part, what with the insistence of a silence more firmly enforced than someone on a silent retreat. A place full of books, dead tree variety, ebooks and others really ought to be a social destination, in my view. Wikipedia is my go-to for quick info on pop culture, modern references and unimportant questions, but if I have something important to research I barely use it. ...and how accurate are the figures from opensite.org, which form the basis of the is infographic? Oh I'm not putting my hand on a stack of bibles and swearing to anything regarding the infographic either. It's there and you make of it what you will. The sources are listed at the bottom of the infographic and you have to decide yourself how credible it sounds to you. That's why I always just say "let us know what you think of it in the comments". Everyone has to draw their own conclusions and decide what they want to believe or not. "Make of it what you will"? How irresponsible. How is thinking for yourself and drawing your own conclusions, and not blindedly accepting what others tell you, irresponsible? Thinking for yourself - excellent.! Drawing your own conclusions - terrific! Publishing them as though they are Truth - dodgy. Publishing it in an uncritical forum - dodgy. Trading responsibility for your influence for freedom to express - slippery slope. A statement like, "Make of it what you will" implies "Any ol' stuff can be posted"
I suspect you are wiser than that. More than anything else, I think the prevalence of Wikipedia over other encyclopaedias is part of the ever-present and still growing trend towards all info online and mass collaboration. I find the fact that Wikipedia has an average of 3.86 errors per article as opposed to the Encyclopedia Brittancia having 2.92 is a clear sign that Wikipedia is much more accurate than we tend to credit it. After all, the EB is curated by professionals. So how much more accurate can an encyclopaedia get? (Successful) Wikis are amazing. Look at wikis like ifixit with so many user-provided manuals. Not least, look at this TED talk about taking the tip from Wikipedia to apply crowdsourcing to other means. Please don't blindly trust Wales' editors as "professional". Some yes; others, OMG how-did-they-get-here? It's a ragged front. I just love Wikipedia. It's surely 99% accurate for me. In my whole browsing until today, I never founded any mistakes. What I love is it gives us ultimate quality pictures for free an eg. can be this page which contains pics specially for wallpapers - http://commons.wikimedia.org/wiki/Category:Commons_featured_desktop_backgrounds. Also wikipedia contains articles like 'Viral video' which I think EB can't. It's just simple and contains lots of information. When I visited EB's website, I found it some cluttered. Wikipedia in comparison is simple and beautiful. I amazingly browse it for space information. Space's activities are updated regularly (I'm fond of outer space). Wikipedia now is my premier source of information. Whenever I've to find info about anything I only head to wikepedia coz I know it will give me correct information with simplicity and high quality. Also put anything I mean anything in the search box and information about it will come for sure. Soil, rocks, curtains, soaps, lunch box bla bla It contains everthing. The only people who vandalize wikipedia is the stereotypical "pimply teenager in his bedroom", yeah... sure. I know you didn't say this exactly but if you're going to make an off-handed remark, go after a group that's more likely to defend themselves. Let's not forget those in politics, businesses, advertisers, military and anyone else looking to make a buck or acquire power. Whenever I do any research, what I'm finding is that many articles are sanitized to avoid controversy and limited because different groups are pushing their own agendas. This is besides the fact that these groups are willing to lie, cheat and steal to manipulate information. Whatever kids are learning today, they get from the upper-echelons of society. Well if any pimply teenagers in their bedrooms want to defend themselves, they are free to do so here in the comments! No-one is stopping them! I phrased it like that to show how easy it is for anyone to make edits to articles and then for those edits to be accepted as absolute fact by others. I'm sure a lot of people have the mindset "well if it's on Wikipedia, it must be true". So handing anyone the power (including pimply teenagers in their bedroom) to put stuff on Wikipedia which people will then believe without question can often be a scary thought. Sometimes I think Wikipedia would be more credible if it was staffed and edited purely by qualified professionals - teachers, doctors, lawyers, historians, researchers, etc. All of this "people power" to collaborate on an open source encyclopedia is very idealistic and all well and good but it can be misused and abused as you indicated yourself. according to your own infographic, wikipedia has approximately ONE more mistake per article than Britannica (3.86 vrs 2.92), and both are pretty low numbers. and wikipedia mistakes are caught within hours, vers what a year (?) for the editions compiled by the smart guys without pimples. methinks your bias is showing a bit to much.